A ROAD has been reopened after a car hit a tree this morning (October 21). Firefighters had to remove its roof after the car crashed into a tree in Titnore Lane at 7am, about a mile north of St Barnabas House Hospice. 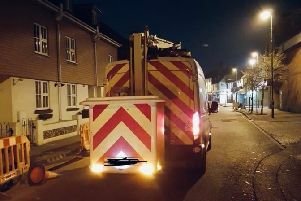 A spokesman from West Sussex Fire and Rescue Service said a man was trapped in the car and crews had to free him before he could be taken to hospital by ambulance. The road was closed while emergency services were at the scene. A Sussex Police spokesman said paramedics on the scene established the driver had minor head injuries.